As posted on the Simcoe.com website, August 30, 2012. BARRIE/LORETTO - Former longtime Loretto resident Donna Chantler has always believed in the importance of helping others, from her neighbours down the street to communities around the world. Chantler, who has donated countless hours of her life working with local church youth groups, food banks and international outreach organizations, will be receiving a Diamond Jubilee Award in early September to recognize the good work to which she’s committed so much of her life. Chantler, a grief therapist and a psychodramatist who moved to Barrie three years ago but lived in Loretto for about 28 years, said she was completely taken by surprise when she learned of the award. For several years Chantler has run youth groups at the Newtown Robison and Bond Head Church, an endeavor she got a taste for at a young age. When she was a teenager growing up in Churchill, she ran an auxiliary girls group for St. Peter’s Anglican Church. She is also a familiar face at the Barrie Food Bank and has volunteered for the Bradford Food Bank, stocking shelves and packing food bundles for families. She recently started participating in the Christmas cheer program run out of the Barrie location. By bridging these two passions, she’s gotten members of the youth groups to help out at the food banks as well. She currently chairs the outreach committee at the Northwest Barrie United Church, which is heavily involved in helping the community through places like the David Busby Centre, Hospice Simcoe, women’s shelters and more. “It’s about raising funds and awareness, I really do believe in educating the public around need,” she said. For several years in Alliston, she ran a bereaved parents group for moms and dads of children who had died. For about nine years, she also ran another volunteer group for grieving children at Adjala-Central Public School and Tecumseth Beeton Public School. Before becoming a therapist, Chantler worked as a nurse at Royal Victoria Hospital in Barrie for several years. But around age 26 she decided it was time for a change. As a grief therapist, she has also worked with other local organizations like Matthews House Hospice and Hospice Dufferin. About seven years ago she embarked on fulfilling her lifetime dream of traveling around the world to do more good. “From the time I was a child I’ve always wanted to work in Third World countries,” she said. She’s worked with various organizations in places like Africa, India, Cambodia, Panama, Peru, and next year she will be visiting Dominican Republic and Bangladesh. 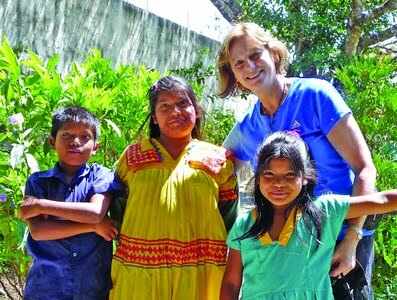 She’s worked with Sleeping Children Around The World, which delivers bed kits and other essential items to poor children, and she has also worked with Global Tier, which focuses on educational programs. “For instance in India, we deliver around 8,000 bed kits,” she said. During her travels she’s also used her therapy expertise to help kids be kids. Chantler will receive her Queen’s Jubliee Medallion Sept. 7 at a ceremony in Vaughan. She was nominated by the Canadian Crime Victim Foundation (CCVF), an organization she has worked closely with for the past ten years. CCVF founder and chair Joe Wamback said she’s very deserving of the award. He describes her an “unsung hero” who has made a significant difference in the quality of life for people in Canada and the world at large. “Donna is one of those people, that since we’ve known her for the past decade, we have never met anyone quite as philanthropic with her time and her own personal energies,” he said.